The Southern coastal mountains of Albania are certainly one of the most rewarding regions for hikers in the entire country. Diverse landscapes, from rugged ridges with an alpine feel to remote villages in green river valleys, and from long, unspoiled beaches to the highlands of the hinterland, the region caters for truly all tastes. Traditionally an area for hiking and recreation, the Llogara National Park forms the northwestern edge of the coastal mountains and covers over 1000 hectares, much of it pristine forests of black pine, Bosnian pine, ash trees and Bulgarian firs. From the Llogara Pass the spectacular range of Mt. Çika and Mt. Qorre extends to the southeast along the coast and gives the term “above sea level” a whole new meaning as you look down on the crystal blue waters of the Ionian sea from above 2000 m.
Behind this mountain range lie perched in the valley of the river Shushica traditional villages, where shepherds still take their herds grazing on meadows and summer pastures and sing iso-poliphony, a traditional part of Albanian folk music, which is even inscribed in UNESCO’s intangible cultural heritage list. 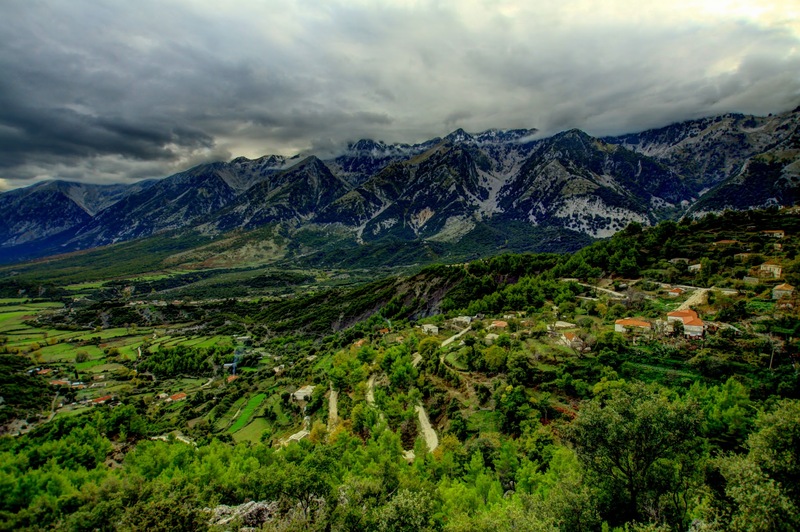 This valley is part of the historical region of Labëria, culturally distinguishable from the rest of Albania in its traditions and folklore. During Ottoman times, the local population were warlike, pastoral people who lived mainly in the highlands of Kurvelesh, Progonat and Vlorë. But also relicts of Albania’s more recent history can be found, with partisan’s monuments and examples of communist propaganda still visible in many of the villages. Walking in the highlands, it is almost hard to believe that sandy beaches and the Albanian Riviera are just a day’s hike away, where traditional old stone houses mix with modern summer tourism resorts. Villages with noticeable Greek influence, old monasteries and flatter territories, while still with the impressive mountain backdrop, invite to explore the area on foot, before rewarding yourself with a swim in the sea.